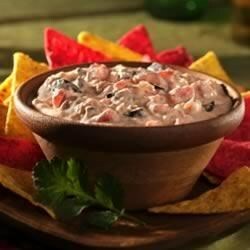 "A simple, no-bake Fiesta Dip recipe that can be thrown together in a moment's notice. A tasty crowd pleaser that's perfect for a tailgate party." Mix dry Idahoan mashed potatoes with salsa, chilies and sour cream. Garnish with cilantro and black olives. Serve with corn chips. great dip! Delicious and super easy to make. I've never had anyone that didn't love it every time I made it! Mashed potatoes give it a different texture and more spread like than dippish. Easy peasy.